what is the baggage limit for domestic flights in India? What is the Baggage limit for Domestic flight in India? 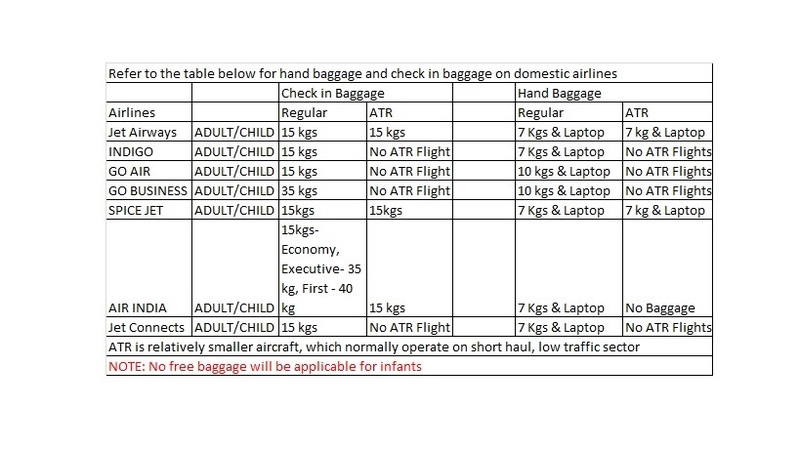 As per the recent notification, standard practice to allow the baggage limit is 15 kg or 33 lbs to the maximum for all the airline operating domestically,except India Airlines, where it varies as per the classification of tickets, for economy class it is 15 kg or 33 lbs, executive 35 kg or 77 lbs and first class 40 kg or 88 lbs, in addition to it they permit cabin luggage with weight not Exceeding 7 kg or 15 lbs. For instance, Spice Jet permits the checked baggage up to 15 Kg. per passenger in case of domestic flights and apart from that a complimentary carry on of a small handbag for personal items will be permitted as the cabin baggage. Other items like a laptop computer, an overcoat or a blanket, an umbrella or a walking stick, some amount of reading material, a small camera, and infant’s food for the passengers traveling with an Infant is also permitted as cabin baggage. Passengers are allowed to carry a maximum of one piece of cabin baggage, as specified in BCAS guidelines, with a maximum weight of 7 kg. The dimensions of the Cabin Baggage should not exceed (L+B+H) – 55+35+25 totaling 115cms for flights operating the Boeing aircraft (737-800/900 ER) and (L+B+H) – 50+35+23 totaling 108cms for the flights operating Bombardier Q400 aircrafts.